I recently came into possession of a knitting machine – a Brother KH-836 complete with many accessories (including a lace carriage!). I wanted to try and make a semi-circular shawl on it, but I just couldn’t find a pattern I liked. 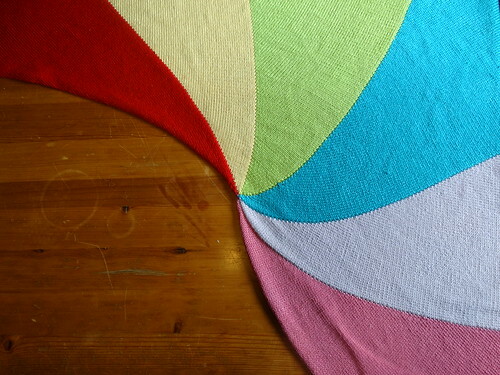 So this is my pattern for a rainbow coloured shawl! It is a little over semi-circular but it means it wraps nicely round your shoulders! This is my first machine knitting pattern, so I hope it all makes sense! 1 standard gauge knitting machine (I hoped this would be obvious). For the edging, I used some leftover 4-ply sock yarn in grey. Tension on the carriage set to about 8.5. It’s easier if you make your yarn into a centre pull ball using a cone winder before starting. Start with the carriage on the left-hand side of the machine and using normal/plain knitting settings. This is worked with the purl side facing you throughout. 1: Cast on 2 stitches using your first colour (by using a slip stitch and a backwards e-loop or your preferred method). I used the furthest left 2 needles (100 left and 99 left) so I could decide how big I wanted to make my shawl based on how it was looking. If you prefer to work more centrally, I used 120 needles in total so you’ll want to start at 60 left. Keep the rest of the needles in non-working position (position A on my machine) for now. 2: Knit across these 2 stitches, and back again. 3: Now bring the needle to the right of the knitting into working position. Knit across and back. You should now have 3 stitches. Repeat step 3 again and you should have 4 stitches. Repeat it again and you’ll have 5 stitches. Keep repeating step 3 until you have 120 stitches, ending up with the carriage on the left hand side of the machine. 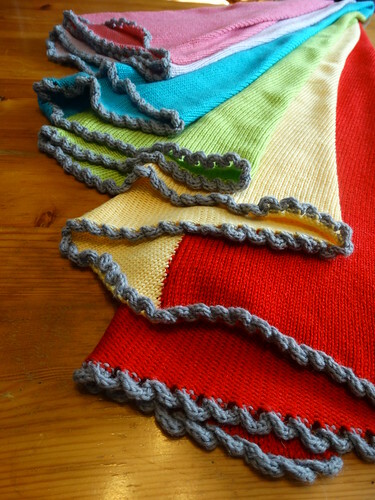 4: Grab your waste yarn and knit at least 6 rows with it. I don’t trust temporary cast offs so I always thread another yarn through the final row of stitches (like a life-line) to ensure that no stitch gets dropped. Once you’ve done this, remove the knitting from the needles and return your 120 needles in working position (B position on my machine). Your triangle is assymetrical (or it should be if you followed the instructions). This gives the shawl a nice pinwheel effect. Make sure you’ve got the purl side facing you still so you pick up stitches along the correct edge. You’ve got the cast off edge which should be easy to identify. To its right you’ve got the increasing edge. To the left you’ve got the usual stocking stitch edge. We’re going to be picking up stitches along this stocking stitch edge. 5: To pick up the stitches, start at the wide end (next to the cast on edge). You should be able to see that there are tighter stitches that look like little knots and then a bar between them. Using a transfer tool, pick up that bar and hang it on the furthest right needle by pulling that needle out into holding position (position E on my machine). Then pick up the next bar and hang that on the next needle in the same way (working from right to left). Keep going all the way to the thin end and you should have picked up 119 stitches. (One less than your total number of needles.) End with all 119 needles out in holding position (position E). 6: Set your machine so it won’t knit the holding needles. (On my machine this is a little switch on the left of carriage which I switch to H, but check your manual for your machine if you aren’t sure. Push the currently empty needle and the first needle into upper working position (position D on my machine). 7: Switch to your new colour of yarn and knit these 2 needles across and back again. 8: Now, push the next needle on the right of these 2 needles into upper working position (position D on my machine). Knit across and back. You should now have 3 stitches in your new colour. If you repeat step 8 again, you’ll have 4 stitches in your new colour. If you do it again, guess what? 5 stitches in your new colour! Keep doing this until you have knit all the stitches you picked up and have 120 stitches on your needles. End with the carriage on the left hand side again. 9: Grab some more waste yarn. Knit another 6 rows in waste yarn and remove your work from the machine just like you did before in step 4. 10: Continue making the 3rd, 4th, 5th and 6th triangles in exactly the same way as this second triangle. (Repeat steps 5 – 9). 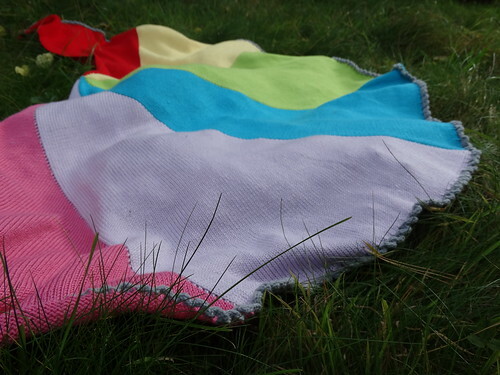 You should have a lovely sized shawl by this point with 6 colourful triangles all with waste yarn cast off edges! We’re nearly there! At this point, return all your needles to non-working position (Position A). 11: To do the pie crust edging you don’t need to remove the waste yarn cast offs. You can do that at the very end. Keep the purl side facing you and go to your first triangle and find the rightmost 3 stitches on the cast off edge that aren’t in waste yarn. Use your transfer tool to pick these 3 stitches up and hang them on 3 needles, bringing the needles into holding position. Be careful to ensure that you don’t get any of the next stitch (which is in waste yarn) and that you go right through the centre of the stitch. Set the carriage so it’ll knit the needles that are in holding position. 12: Knit 8 rows on these 3 needles (ending with the carriage on the left). 13: Pick up the next 3 stitches and hang those on the same needles that you used last time. You should have 2 stitches on each needle – 1 in your edging yarn and 1 that you just picked up. Knit 8 rows on these 3 needles (ending with the carriage on the left). Repeat step 13 until you have 6 stitches left to pick up. 14: Pick up the next 3 stitches and hang these on the needles in the same way. This time, knit 7 rows so you end with the carriage on the right. 15: To finish this off neatly, we have to do the final 3 stitches by hand so we can bind them off at the same time as knitting them. Pick up the final 3 stitches and hang them on the needles and put the needles in holding position (position E)..
16: Now, make the first stitch by hand by laying the working yarn into the latch and pulling it through the 2 stitches to make a new stitch (by pushing the needle back). Using a transfer tool, transfer this stitch onto to the needle to the left so that needle now has 3 stitches on it (an edging stitch, a picked up stitch and the transferred stitch. Knit this stitch (again by hand), pulling the working yarn through all 3 stitches to make the next stitch. Transfer this new stitch onto the final needle and knit 1 more stitch by hand. You should have 1 stitch left on your needles! Cut the yarn and fasten off (pull the tail through the loop). 17: Remove the waste yarn cast offs. 18: Weave in all your ends and block aggressively to reduce the curl. Enjoy your new shawl! I hope you liked this pattern, any questions please ask in the comments below or by contacting me from the Ravelry pattern page.